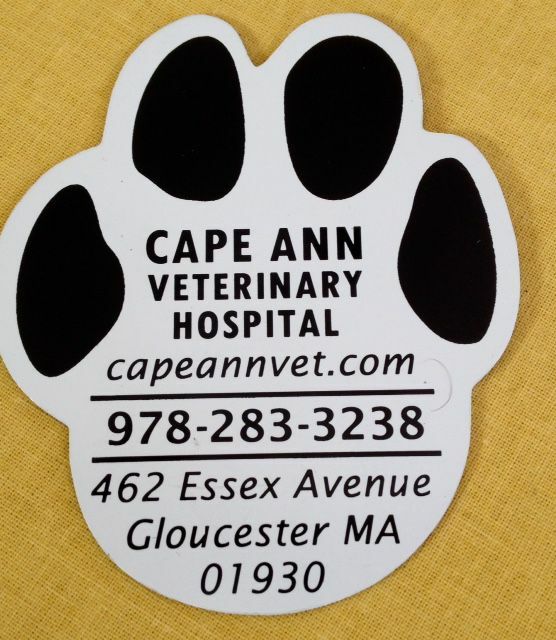 It's FEATURE FRIDAY time once again and today I am introducing a Cape Ann staple since 1979, Cape Ann Veterinary Hospital. Many houses I walk through during listing appointments or showings have one thing in common which is: CAVH's cute paw-magnet on the refrigerator. It seems that many pets and their owners have chosen Dr. Jeffrey French and his team of outstanding doctors. When visiting Cape Ann Veterinary Hospital, there is an immediate sense that the staff care for and love our pets every bit as much as we do. Adjacent to the parking area is a wonderful little park with flowers and statues where dogs can walk around before or after their appointment. There are treats on the counter, the staff greets the patient by name, and there is even a special waiting area reserved for cats so they don't have to share with dogs unless they insist. The examination rooms are clean and comfortable. CAVH has very convenient hours, Monday through Friday from 8 am until 6 or 7 pm depending on the day, as well as Saturday until 2 pm. They also have another clinic location in Rockport (Wildon Heights) which is open on Mondays and Wednesdays from 4 pm-7 pm by appointment only. In step with the long hours there is a fleet of doctors taking care of your pets. In addition to Dr. French who opened the clinic 36 years ago, Dr. Barbara Reid, Dr. Douglas French, Dr. Katherine Bradley, Dr. Lee Powell and Dr. Kate Dodge are available for regular appointments and emergency visits. CAVH is a full-service facility where pets can come for regular check-ups, vaccinations, surgeries, dental procedures and microchipping as well as emergency and urgent care. Boarding options for cats are also offered. They welcome dogs, cats, bunnies, birds, hamsters, guinea pigs, turtles and whatever else somebody may consider a pet. They offer guidance when faced with the loss of a pet and will make arrangements for cremation and/or burial. I was very touched when I received a notification that Dr. French had made a donation to an animal research center in memory of my dog Pedro when he passed away. My babies, Chihuahua Diego and Ragdoll cat Leonie, have received outstanding care at CAVH since they were just eight weeks old. I especially appreciate that the medical team at CAVH does not overmedicate pets just to make money. This was one of the main reasons why I switched to CAVH from a Peabody facility with my previous dog. After an evaluation of Pedro's medications they found several were treating the same condition and were not all necessary. They far and foremost have the well-being of our pets in mind. This time of the year and well into fall it is still crucial to make sure your pet did not pick up a tick while roaming outside. Ticks can cause many diseases, with Lyme disease being the most commonly known. If you have discovered a tick on your pet and are not sure how to safely remove it yourself, please see one of the doctors at CAVH. They are able to expertly get rid of the tick, treat the bite so it does not get infected, administer a blood test and, if needed, prescribe antibiotics. Like with humans, fast action is key when dealing with a tick-borne illness. If you notice that your pet is lethargic, tired or limping, don't hesitate to call CAVH as each of these may be a sign of tick disease. We are very lucky to have such an excellent, versatile animal hospital right here on Cape Ann.